The SISIS Multislit is a tractor mounted deep slitting lawn aerator for sports field maintenance, fine turf and amenities, offering deep, clean penetration with minimal surface disturbance. Suitable for maintenance of football, soccer rugby and cricket pitches and golf courses, it can also be used for lawns and gardens. Aeration is a key process to improve drainage, reduce turf compacting, thatch build up and boost the health of lawns and the Multislit is an ideal tool for outstanding turf and lawn treatment. The Multislit produces excellent underground cultivation due to the angle of the tines and spiral design of tine shaft assist penetration and its simple design requires little maintenance. 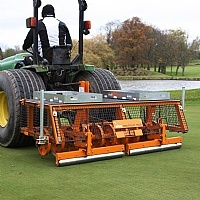 Working depth: 6" or 8" 6" or 8"
Choice of interchangeable slitting tines to suit different ground conditions. The angle of the tines and spiral design of tine shaft assist penetration giving maximum underground cultivation with minimum surface disturbance. Tine plates have a wide rim to reduce marking in soft or undulating conditions. Simple design for low maintenance. Can be used with most trucksters by use of a Variable Pressure Frame. Weights (weight bar will accept max 10, 25kg weights ref. F33150). "We use the Multislit on the greens and fairways. 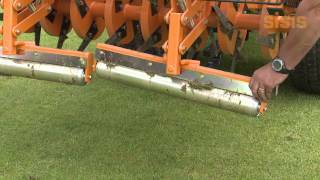 Our surfaces are as good as anyone's"
The SISIS Multislit is a tractor mounted deep slitting lawn aerator for sports field maintenance, fine turf and amenities, offering deep, clean penetration with minimal surface disturbance. Ideal for maintenance of golf courses.